Small problem with Patch Tuesday, last: if you're running Windows XP and Microsoft's .NET framework, the update cycle never ends. You may be thinking, "Heh, you've got that right. With Windows, you'll be patching forever." But we're not being sarcastic -- due to an unknown bug, the update process could loop. Far as MobilePhonesFan can tell, the problem is related to patches KB2518864, KB2572073 and KB2633880. 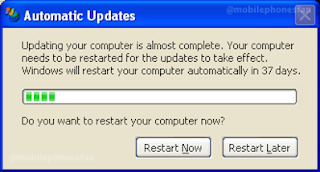 Users report the Windows Update download and installation proceeded normally enough, but they were later prompted to download exactly the same updates, yet again...and so on, ad nauseum. If you've encountered this glitch and you're looking for sympathy from fellow sufferers, a search of the Microsoft Answers site produced this thread. If you're mad as hell and you demand to know the latest from Redmond, then here's Microsoft's most recent statement on the matter, dated 18 May. Which is not to say they've actually done anything helpful -- we're not aware of an official advisory, much less an unofficial fix. And even the most casual search of Microsoft Answers reveals that a long list of disgruntled people have shared their feelings on this topic, since that 18 May statement. So, then, business as usual. Look for an update, soon as there's more to report.